A view of the city from the Gaudí-designed Park Güell, on Carmel Hill. The once scruffy and freewheeling city by the sea may have polished up its act, but it hasn’t lost its edge. Andrew Sean Greer goes in search of artists, musicians, and chefs who are keeping the Catalonian spirit of creativity alive. What madness is this? It is the feast day of Sant Jordi, and Barcelona is nothing but books. Only the day before, you could stroll down La Rambla with a paramour, watching the well-dressed crowd, listening to an old man playing flamenco guitar. Now it is an infestation of bookseller stalls and masses thronging to get in. “Sant Jordi is in the air!” one digital banner proclaims, and you can believe it: everywhere authors are shaded in tents, signing and signing until they have to switch pens. In the courtyard of the avant-garde Antic Teatre, one of the many hidden throughout Barcelona, there is no room to move beneath the canopy of its fig tree. It is everywhere poets, a merry celebration of love. In Japan, on “White Day,” men give women chocolates. In the U.S., on Valentine’s Day, lovers give everything from plush animals to edible underwear. In Barcelona: books. Couples sit on the marble steps of banks and churches, kissing and exchanging books and roses. A fitting sight, considering this city’s historic romance with literature and art. Don Quixote even visits a Barcelona printing press in Part II of Cervantes’s magnum opus. In the 19th century the city was home to the Modernism movement that, as part of a rebirth of Catalan culture, gave us such great artists as Miguel Utrillo, Joan Miró, and Antoni Gaudí, and cultivated the geniuses of Pablo Picasso and Salvador Dalí—a love affair across centuries. Left: A view of the Sagrada Familia, the masterpiece of renowned architect Antoni Gaudi. Right: Artist J. Loca at Med Street Art's gallery. Barcelona is the third-largest city on the Mediterranean and, with 1.6 million people, the 17th most populous in Europe. Picture a baseball diamond: from home plate to first base, the coast of the Mediterranean; from first to second, the river Besòs; from second to third, the Collserola mountain range; and from third to home flows the river Llobregat. These form the natural borders of Barcelona. The diamond is roughly cut in two by Avinguda Diagonal, and the southern portion holds the densely populated neighborhoods known best by visitors: wild, bar-crawling El Raval, highstreet shopping L’Eixample, and the medieval Barri Gòtic. Districts toward the city edge, however, are sparsely populated, the hills to the north are covered in forest, and the northeastern border is a desert of empty lots and industrial plants. The citizens still cluster near the center, where the density of living makes for a walkable city; a determined Barcelonan can get from the Monumental metro stop to the Barceloneta beach in 30 minutes. 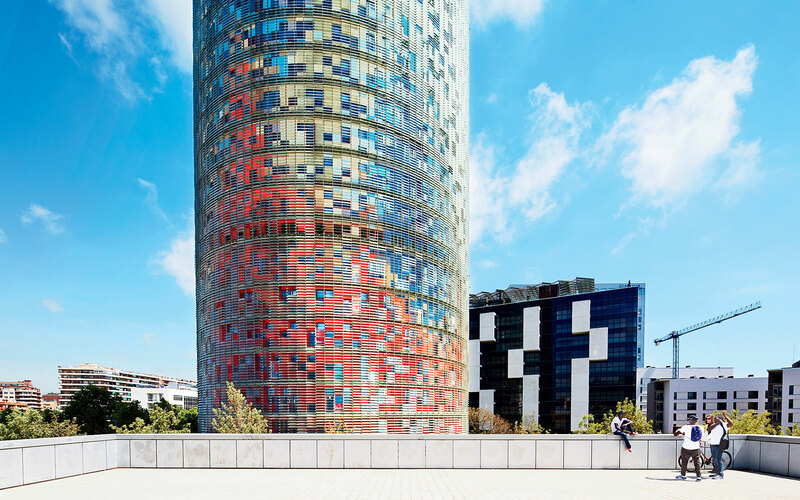 The 38-story skyscraper Torre Agbar, which opened in 2005. I’ve been coming here for decades, and every time I can still find my old beloved city. I can wander through the labyrinth of the Barri Gòtic, lost beyond all measure, until suddenly I turn the corner and there it is, the place I was looking for. I can still belly up to the bar at Barceloneta’s El Vaso de Oro, a tapas joint decorated with beer steins and yellow lampshades, grabbing the solitary free seat amid the crowds of laughing workers, futbol teams, and first dates; the bartender will still call me “capitán” even though I have never been to sea. I can still stroll Passeig de Gràcia and watch the smartly dressed couples sipping cava or heading to the opera. The Barceloneta beach still pulls the city’s citizens out to the Mediterranean. Dinner will always be at midnight, and the dancing will never start until two. The cranes will toil forever finishing the sandcastle fever dream of Gaudí’s Sagrada Família. The rivers that flank the city will never change their courses; the mountains will never head north; the sea is unlikely to go dry. But the city’s timeless pleasures aren’t what I’m in search of on this trip. Rather, I’m here to find out how one of Europe’s greatest cultures is meant to evolve, even as it grapples with gentrification, unemployment, and financial setbacks. At dawn, I awaken to the sound of women talking as they hang their laundry out to dry. 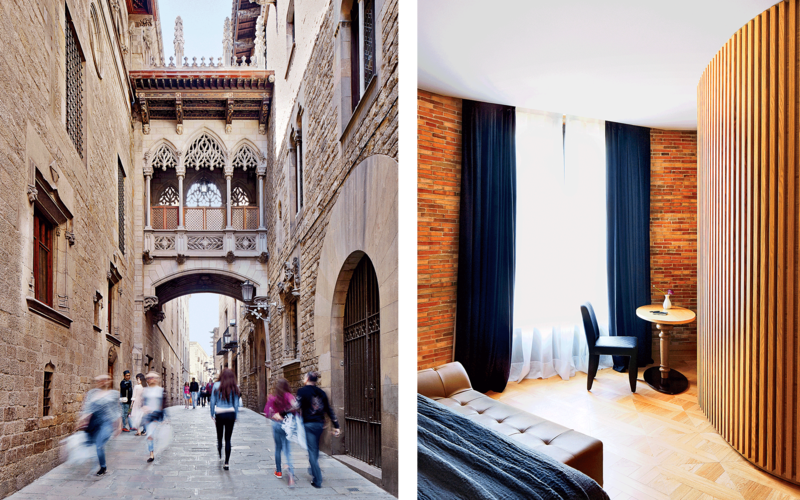 I am staying in Casa Bonay, an 1869 sun-washed building converted into a hotel whose eccentricities include rooms divided by old-fashioned sliding doors and patios that open onto a courtyard shared with real Barcelonans. I am lucky enough to have an old friend in the city, Javier, who with his pal Andreu is waiting downstairs in a car to take me on an arts tour. We drive to an old factory where we are greeted by a 41-year-old street artist named J. Loca. J. Loca translates as “Crazy J.” His works feature screaming men with double uvulas in their throats, and when J. Loca opens his mouth—he has one, too. Why would I be surprised? 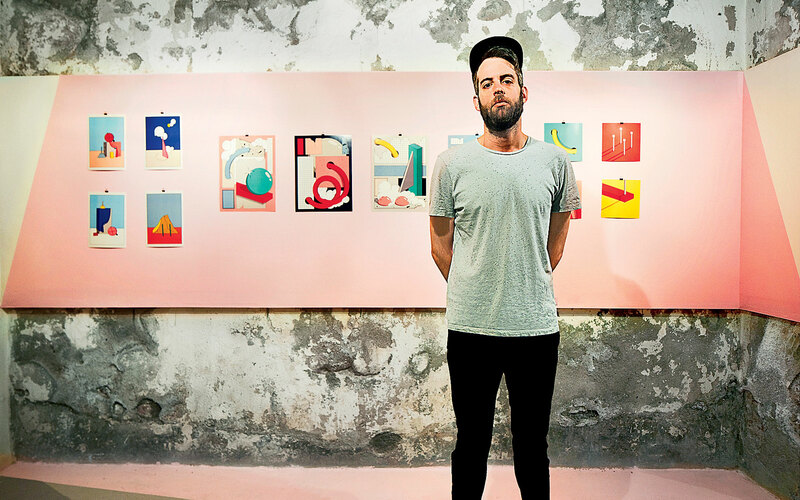 We are on what Javier calls the “right-hand side” of Barcelona, far from the hotels and chic neighborhoods of the “left,” in a space that J. Loca and others at Med Street Art have transformed into a light-filled, white-walled gallery. J. Loca (real name Jordi, like the saint) is a short, energetic man. Showing me the new exhibition, he takes me from canvas to canvas. From behind us there comes a cry: “Jordi!” This is Jan, his English friend from the Barcelona art scene in the nineties, days when graffiti artists would do work on buildings while neighbors encircled them protectively. Now they are artists doing respectable gallery shows. And opening galleries of their own, such as this one. The excitement in Jordi’s voice as he describes his project to Jan—to make a new neighborhood in Barcelona, an artists’ neighborhood—is something I will come to recognize, as well as the loss at the bottom of it. Barcelona has irreversibly changed. Ever since the city remade itself for the 1992 Olympics, it has been a tourist electromagnet. The free-spirited neighborhood of El Born, for example, which houses the Picasso Museum and some of the artist’s old haunts, has turned, like the Marais in Paris, into a popular address for the wealthy. Most of the famous Barri Gòtic galleries have been kicked out to make room for luxury shops; and even the grungy old fisherman’s district Barceloneta now has a W hotel. So it goes. Cities like San Francisco and Berlin and Barcelona, known for their creativity and freedom, attract the world with their charms, and change is unavoidable. But can they keep that spark alive? Or does it inevitably vanish? 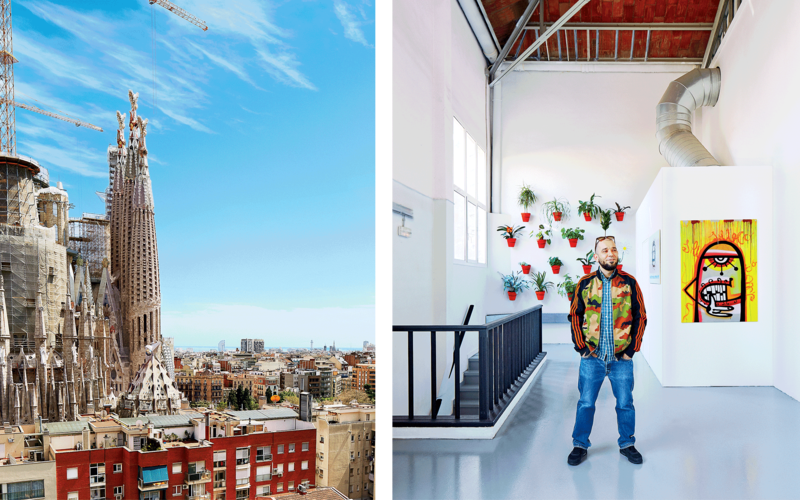 “I want to show,” Andreu tells me, “that the Catalan culture lives.” He very much believes that an imaginative, iconoclastic Catalan spirit still thrives. Right: A suite at the Monument Hotel. The next day, I am introduced to “the George Clooney of chickens,” or at least this is how Andreu refers to it. This is not a person; it is a chicken and, to Catalonians, a work of art. In Barcelona, when you’re talking about art, the conversation naturally turns to food. Lola Malet, the woman who keeps the birds, is a cheerful lady with a dandelion fluff of light-brown hair, and she leads us through her lush foxglove garden to a large, clean, fenced-in coop. And here he is: George Clooney. Rather tall for poultry, with sleek amber feathers and a bright comb, striding like a soldier among the hens on his legs of pale blue. Jan and I exchange glances. Handsome, sure. But rather a disappointment, considering. It is only later, at Ona Nuit, a Prat restaurant devoted to seasonal Catalan food, that we come to truly appreciate the pota blava. The real George Clooney, cooked slowly for 10 hours in oil, wouldn’t taste nearly as delicious. The artist Mariano Pascual at Studiostore. When I meet later with the chef of Ona Nuit, a young woman named Susana Aragón, she shows me a photograph of a gold bar on a plate. “This is my new creation,” she explains proudly in Spanish. “This is an ingot made from pota blava. Powdered in gold.” She looks at me carefully to be sure I understand. “Because it is a treasure.” The earnest nature of this moment—the pride in tradition held by a people historically separate from Spain, the beauty and absurdity of it all—feels, to me, distinctly Catalan. The gold ingot connects the Catalan culinary arts from its most basic form to its most exalted: the famous haute cuisine of Barcelona. Food, after all, has arguably become Spain’s most expressive medium, taking the reins from art itself. 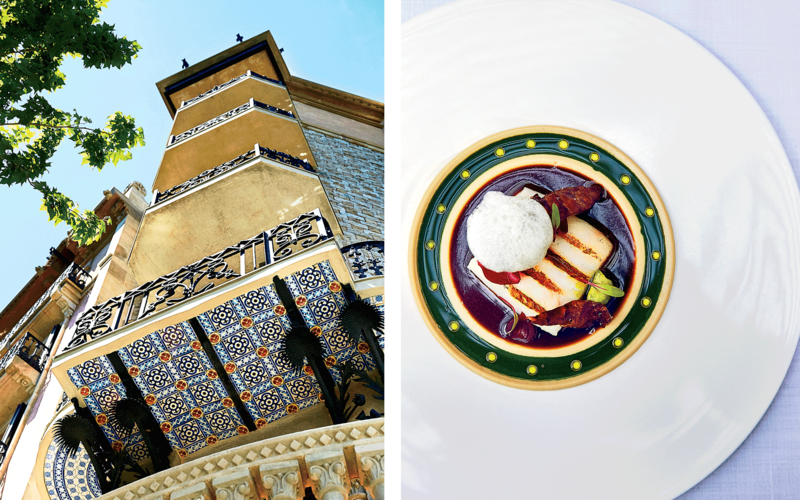 El Bullí, the restaurant that pioneered molecular gastronomy and was named the Best Restaurant in the World by Restaurant magazine from 2006 to 2009, was a two-hour drive north of the city. It closed a few years ago at the peak of its popularity— its chef, Ferran Adrià, wanted to focus his efforts on education—but in its wake two superstars have emerged in the city proper: Lasarte, a new restaurant from famed chef Martín Berasategui attached to the Monument Hotel, and the more established ABaC. At Lasarte everything has been rarefied and transformed—“gin and tonic” for dessert, in bubbles—the perfectly timed service is like eating in a clockwork world. ABaC, much farther afield in the northern residential neighborhood of Sant Gervasi– La Bonanova, feels even more fantastical, with the rough calçots and artichokes of Prat turned into shiny toys, and just when you think it has tipped into the absurd—dried lamb being made into tea tableside, for instance—the waiter grins and you understand they are joshing you as well as feeding you. Two music producers, famously known as the DJs Pin&Pon, serve me San Miguel beer on the terrace of their flat; joining us is Andreu, who has brought me here, and their enormously fat black cat. “I am optimistic,” says skinny, dark-bearded Pin about the future of music in Barcelona. Pon, broader and more silver, muses over the idea: “I am not optimistic.” They now run the label El Genio Equivado and represent about 20 recording artists, the bulk of whom are from Barcelona. They say there is an emerging music scene, and they curate a night once a month at one of the major clubs to promote new music. But with so many sound ordinances in Barcelona and new taxes in Spain, it’s hard for a young artist to come up in a world that feels fully booked. Left: A sculpture depicting Lenin’s head, used as a box office at Nau Bostik. 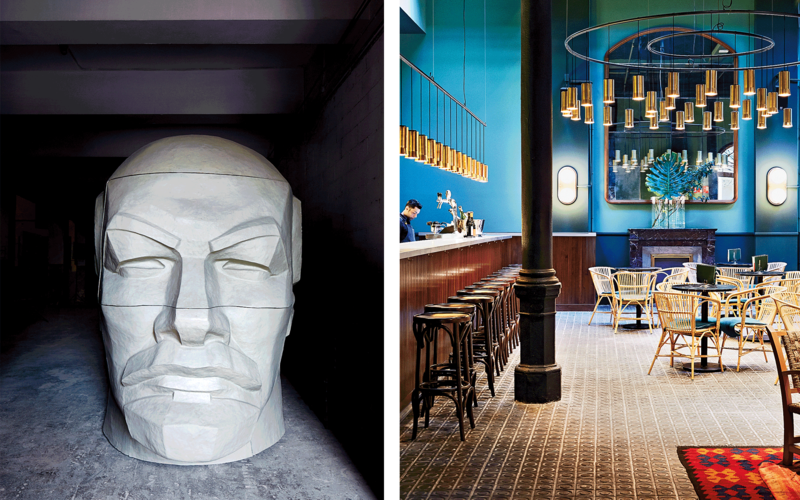 Right: Libertine, the restaurant at boutique hotel Casa Bonay. And it is—the already-large clubs like Razzmatazz and Apolo are flourishing in the current mania for electronic dance music, or EDM. A late-night tour of El Raval, a formerly dangerous part of Barcelona west of the Barri Gòtic, reveals a hipster subgenre of nightlife, where every bar has a DJ and every bartender a signature cocktail. Having sampled margaritas in bars along the narrow alleys, we find a perfect one at Betty Ford’s, a junk shop of a bar with, yes, a DJ, where the bartender happily takes her time preparing our next round. She thinks for a moment, then adds, “I think I know what you are looking for. Come with me.” She means Nau Bostik, a place where art is very much alive in Barcelona. Not the tourist galleries or the governmentsponsored studios, as well-meaning as they may be, but a spot on the northeastern border of the city. Soon after, I find myself abandoned beside a set of railroad tracks. Giner has waved goodbye. A few blocks west is the working-class neighborhood of La Sagrera, far from the tourist center, with its plain residential blocks. I am at the very edge of the city—there is nothing but mounds of dirt and crumbling concrete walls. I hear the highway humming along nearby. This is Nowhere, Barcelona. Giner has told me to walk until I find a chain-link fence and a rolling gate with weeds growing all around. I haul it aside and step into a concrete yard beside a row of dilapidated factory buildings. Most of the doors are closed, but through one I glimpse a gargantuan sculpted head of Lenin. It is through this last door that I find the artists of Nau Bostik. In the giant room, by a makeshift bar, sit four or five gray-haired men, smoking. One man raises his hand and greets me in Spanish. After so many days in Barcelona, talking in Spanish about art and music and bluelegged chickens, the fog of language is beginning to clear and I understand that this is Pablo Pérez Losada, the photographer and curator I have come to meet. The artist Blanca Haddad in Nau Bostik, a shared studio space. “We received the key one year ago,” Losada tells me, meaning himself and Xavier Basiana, or Xavi, the real mastermind of Bostik. This is the third space they have transformed into artists’ studios. “We have a contract for five years, until the train station is completed.” Losada gestures to the north, where construction on a new Frank Gehry–designed rail terminal is under way. (The government says it will be completed in 2019; Giner thinks there is no more funding.) Bostik houses performance and exhibition spaces, media rooms, and dozens of artists’ studios. In the future, attic bedrooms will house artists in residence. Later, we stand on the rooftop looking out on the uncompleted railway station. What happens, I ask Losada, if Bostik does transform the neighborhood, and the train station opens, and their lease is up, and, because of the popularity of the area, they are asked to leave the place they have made? It is, after all, what has happened to almost every collective before them. Artists come, make something from nothing, popularize the place, and then are forced out. But all I can think about is the day I first arrived in a city gone mad: lovers everywhere; roses everywhere; playwrights everywhere. It is the memory of books that amazes me. Nothing could be less social, less loud than a book—reading is a private experience—and yet in Barcelona, the art form is in full celebration. On the feast day of Sant Jordi, poets are knights and novelists are kings. Is it gone? I recall a crowd applauding a bespectacled author arriving at a book signing. This is the city that has just been named a unesco City of Literature. It may seem, to artists who remember another time, as if it has all faded away. The “vandal art” that Jordi and Jan recall was painted over long ago, or else the buildings were torn down. The “painters district” is now home to elegant residences; the seedy graffiti-art district of El Raval now has bars and dance clubs for the likes of me. And yet I recall the young artist Mariano Pascual, stroking his beard in a shy manner, talking about artists like himself coming from all over the world to Barcelona, about new galleries opening and closing, about the struggle to make a living that any older artist would recognize. To him, it is not gone. 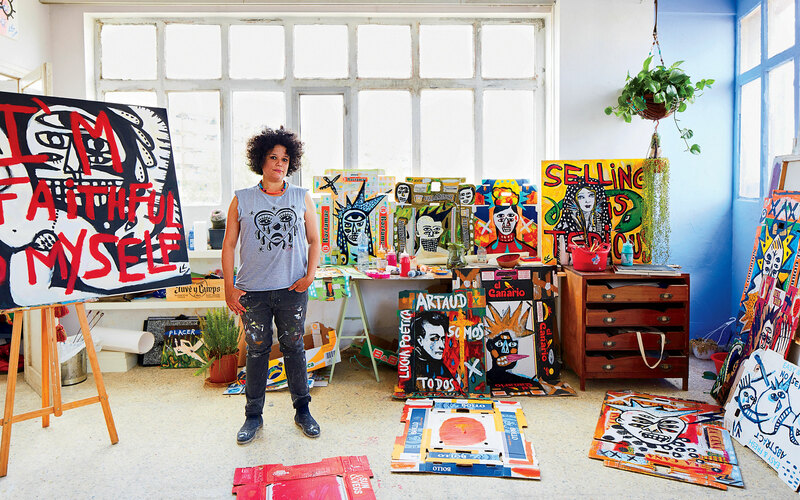 Nor to Blanca Haddad, painting away in her factory studio to the strains of punk rock. Nor to the crowds that surrounded me. The battle is not the war, after all. There is the taste of gin and tonic on my lips; roses decorate the medieval pathways of my mind; the blue legs of the George Clooney of chickens appear in my imagination. Perhaps, as with any romance, Barcelona may struggle to keep it fresh, but it is a city still very much in love. Left: The exterior of the Monument Hotel, home to Lasarte restaurant, which is helmed by famed chef Martín Berasategui. Right: A plate of roast turbot at ABaC. Get more editor picks in our Barcelona Travel Guide at tandl.me/barcelonaguide, and get the T+L Travel Guide app from the App Store or Google Play. Casa Bonay: A new design-centric hotel in L’Eixample where the restaurant staff’s uniforms are in the same tropical print as the wallpaper. casabonay.com; doubles from $120. Hotel Majestic: Every detail, from the lobby chairs to the éclairs, has been polished to perfection at this classic address. hotelmajestic.es; doubles from $275. Monument: This luxurious, urbane property is set on the fashionable Passeig de Gràcia, steps from several Gaudí buildings. monument-hotel.com; doubles from $365. ABaC: A Michelin two-starred kitchen in Sarrià–Sant Gervasi serving innovative dishes like smoked steak tartare with pepper-bread brittle. abacbarcelona.com; prix fixe from $155. Cal Pep: Try Spanish classics like arroz con bogavante and tortilla española at this famed tapas bar deep in the Barri Gòtic. calpep.com; small plates $6–$25. Elephant, Crocodile, Monkey: Chef Estanislao Carenzo serves international dishes like Jerusalem artichokes with sweetbreads. casabonay.com/dining-drinks; entrées $15–$27. El Vaso de Oro: Famous for its Padrón peppers and steak with foie gras. vasodeoro.com; entrées $13–$24. Lasarte: The dishes at the Monument hotel’s Michelin two-starred restaurant offer inventive takes on seasonal specialties like Wagyu carpaccio with extract of tarragon. restaurantlasarte.com; prix fixe from $165. Ona Nuit: The 10-hour Catalan chicken is the thing to order at this Slow Food restaurant near the airport. onanuit.com; entrées $11–$20. Carxofada: The town of Sant Boi de Llobregat honors the beloved artichoke with inventive dishes, tours, and performances. March. Fira Avícola: The region’s popular chicken is celebrated during late fall in El Prat de Llobregat. December. Sant Jordi: Each year locals celebrate Saint George’s feast day by exchanging roses and books on April 23.